An electrifying work of investigative journalism that uncovers the powerful group of immensely wealthy ideologues who are shaping the fate of America. 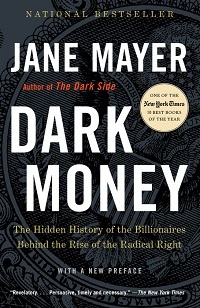 In a riveting and indelible feat of reporting, Jane Mayer illuminates the history of an elite cadre of plutocrats—headed by the Kochs, the Scaifes, the Olins, and the Bradleys—who have bankrolled a systematic plan to fundamentally alter the American political system. Mayer traces a byzantine trail of billions of dollars spent by the network, revealing a staggering conglomeration of think tanks, academic institutions, media groups, courthouses, and government allies that have fallen under their sphere of influence. Drawing from hundreds of exclusive interviews, as well as extensive scrutiny of public records, private papers, and court proceedings, Mayer provides vivid portraits of the secretive figures behind the new American oligarchy and a searing look at the carefully concealed agendas steering the nation. Dark Money is an essential book for anyone who cares about the future of American democracy.